More recently, a lot of people have opted for composite decking. This has all of the style and workability of wood without presenting all of the common issues that wood has like mold or scratching. While there are pros and cons for either wood or composite decking, most people agree that composite decking is much more durable. One main issue with composite decking is that it has been known to be practically stain-resistant. This makes it very difficult when you desire to make your deck look new and vibrant again. However, it can be done. 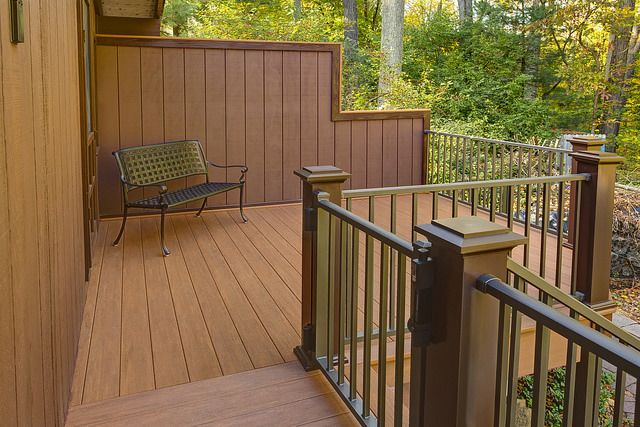 Here's everything you need to know about how to render a composite deck stain. Composite Staining: Can It Be Done? While it involves quite a bit more care and a different technique than staining a regular wooden deck, it can be done. However, there are some differences in wood staining versus composite staining. The standard procedure for wood restoration needs to be changed. For example, the pressure used must be gentler than usual. Also, the pressure washing tip needs to be at least twelve inches away from the surface, as it is very easy to make marks on composite surface. Once the surface is cleaned and all of the grime and dirt removed with the pressure washer, you can apply the stain. It's up to you whether you use a brush, roller, sprayer, or pad applicator. -Use a wood cleaner before you stain the surface of your deck. A lot of the dirt and grime can affect the outcome of your project. -When painting with a brush, always use a back-brush method. This will ensure an even application. -Apply the stain first to vertical surfaces. As you do so, be careful not to allow the stain to drip onto horizontal areas. -Work through the entire board length, including the end. -Apply coats evenly to the whole surface. -Allow time for the stain to dry before allowing foot-traffic through the deck. This will ensure an even and aesthetically pleasing deck. Which Products Can Be Trusted? You have to be careful when choosing the stains for your composite deck. Always make sure that you are choosing a color that matches or complements your original deck color. Otherwise, it will be difficult to change from one color to another in one coat. Certain stains will hold up better than others. It is important to pick one that has proven itself durable for the climate you live in. If you live in Kentucky, for example, you'll know the weather ranges from the sun beating down on your deck, to summer thunderstorms, then to snow in the winter. The stain you choose needs to have all-season durability for this situation. Well known products that you can use for this project are Sikkens, Penofin, Behr, TWP, Ready Seal, and Cabot. Which Surfaces Cannot Be Stained? While a lot of composite decking can be stained with little to no issues, there are certain surfaces that you will have problems staining. PVC decking, which is essentially decking that is wrapped in a plastic material to ensure durability and longevity, cannot be stained using this method. Your best bet to ensure that your deck can be stained is to speak with deck staining experts. Staining your composite decking is not as much of a challenge as it used to be. With new brands and colors of stains, it has never been easier to achieve the color and look of your dreams. With these helpful tips and resources, you will be able to fully transform your wood surfaces. The only thing left to wonder is what color chairs will look best on your new and improved deck.